Granted, this might be the yuppiest thought to have ever been uttered, tied only with “OMG! They’re out of pumpkin spice lattes!” and “Ugh my premium high speed internet is totally only running at the speed of standard” but can I just ask what the heck we did before CSAs? All over the country, small farmers are pulling insanely fresh, plump vegetables out of the ground and off of vines or trees or… wherever one finds vegetables 🤷‍♀️ (See, this is why I leave the farming to the farmers). Anyway, I only mention it because a CSA means you not only get to support these fabulous farmers, but receive, in return, a weekly box full of said freshly picked veggies (and, in some CSAs, fruits too), and do incredible-slash-incredibly-simple things with them, like make Ratatouille. Every week, I open my box with big eyes and a hopeful stomach, hoping for another round of the crisp zucchini and juicy cucumbers that were in last week’s box. It seems like my CSA’s cucumber stock has been exhausted (damn. But don’t think I am not still making fridge pickles. ), but they’ve wisely softened the blow by replacing them with plump tomatoes and long, smooth Japanese eggplants. 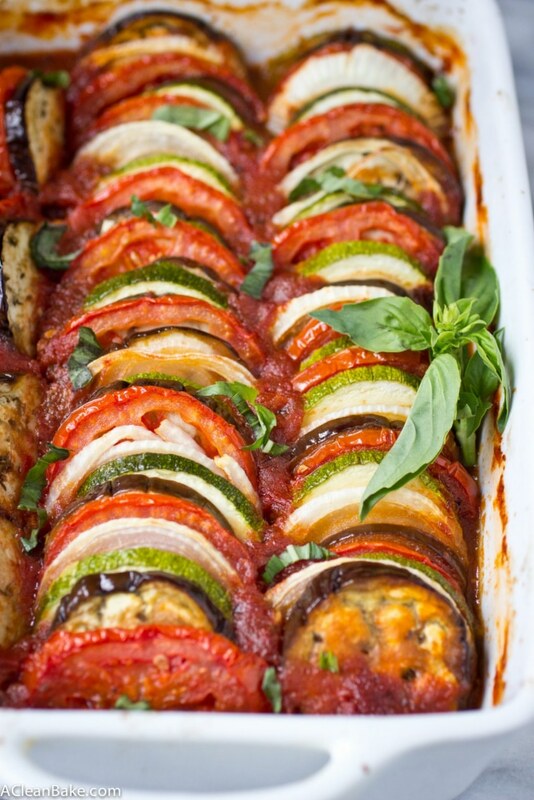 Those, combined with the extra onions that went unused from this recipe, just screamed MAKE ME INTO RATATOUILLE! What the heck is ratatouille? It’s not not the fancy, complicated dish that the name sounds like. Oh, and it’s not a cartoon mouse either, as it is probably primarily known in the United States. (As someone who, as a rule, detests cartoons, the degree to which I adore that cartoon mouse is somewhat alarming. But that’s for another post. But seriously, how could you not love that face?). It’s a simple and casual dish that originated in France, probably as peasant food. The heart of the dish is stewed summer vegetables, with very little else, so the flavors of the peak-season vegetables shine through. from the probably-original rustic peasant stew in which the veggies are roughly chopped and simmered or baked in a thick tomato-based sauce, to an overly fancy and (if you ask me) time consuming swirl, culminating in a flourish of some kind of flower pattern in the center. Not me. The easiest way to do it, in my opinion, is to quickly stir the sauce together and pour it into the bottom of the pan (you could even mix it in the pan if you wanted to) before layering the veggies on top. I like to slice the veggies up separately and then create an assembly line so you can grab them in order, shove them into the pan and then grab another set. That’s the easiest way to get this dish to look like you spent all day on it, but we’re really only talking about an extra 2-3 minutes of effort. Don’t worry about perfection here. If you look closely at my version, you’ll notice that the pattern is spotty at best, betraying my limited attention span while I was putting this together (no matter how many times you watch Gilmore Girls through, it is always SO good, amiright?). But look, if you came to this site for perfection, you might be sorely disappointed. We do our best, but I’d rather have stellar flavor and an imperfect veggie pattern any day. And, boy, does the flavor deliver on this. Great quality fresh vegetables have a beautiful flavor on their own, and I also used super high quality crushed tomatoes (in this case, they were also from my CSA, but you can get good quality canned tomatoes at the store. Try San Marzanos, if you can find them. It’s worth the investment). So, the dish didn’t need much help, but I added a couple of flavor enhancements – fresh garlic and basil, and a spice mix called Herbs de Provence – just to take it over the top. Please don’t hate me for requiring you to buy a new spice for this dish. It is 100% worth it, and you can sprinkle it on chicken and potatoes for a quick, one pan weeknight dinner (or use it for these recipes). If you really don’t want to purchase Herbs de Provence, you an replace with 1/4 teaspoon each of dried or fresh rosemary, oregano and thyme. But wait, we haven’t finished discussing THIS quick one-pan weeknight dinner. It’s super healthy, quick and filling, and all you need to make it a meal is your favorite protein. I picked up a rotisserie chicken to accompany this, and then subsequently ate the leftovers cold with a runny egg on top for breakfast. But it can just as easily make for a wonderful addition to a dinner party menu. And the leftovers! Oh my goodness. After a day or two in the fridge, the flavors mature and meld and I’m not committing to anything here, but there is a chance the leftovers might be better than the freshly made dish. So, all I’m saying is you should probably double the recipe…just to be safe. Before you start cooking, here are a few more tips to make sure you get the most out of this recipe! 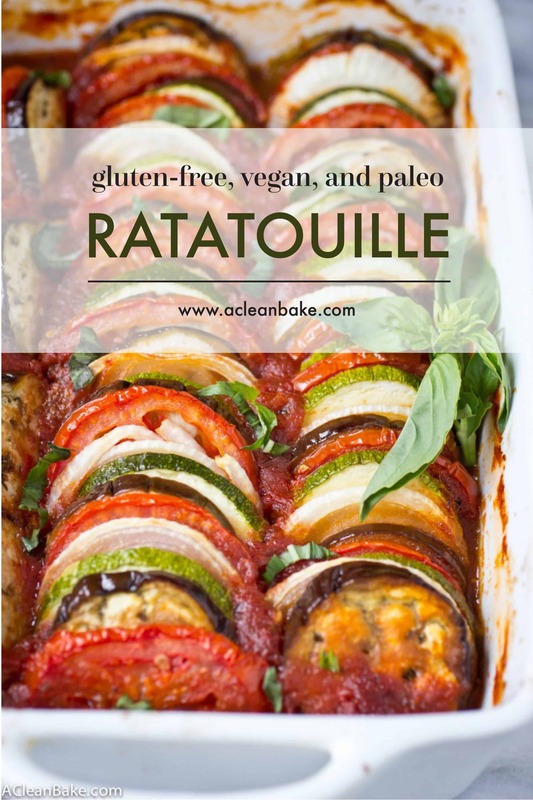 One last thing: French readers will say this is not, in fact, ratatouille. It’s Tian! I know, I’m perpetuating Ratatouille lies a little bit. Traditional Ratatouille is actually more of a stew of chopped vegetables (including green or red bell pepper, which I am not including here), all of which are cooked in a dutch oven. It’s a slightly less fussy dish. 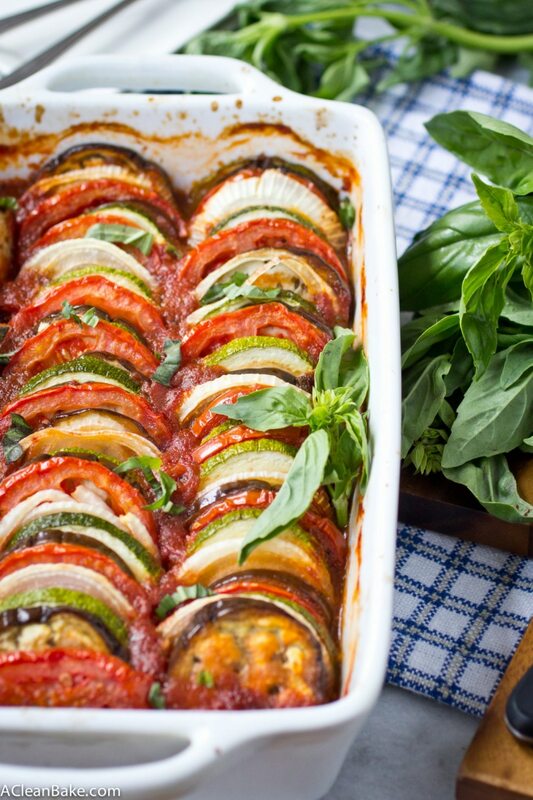 This Ratatouille recipe comes together quickly for a fresh weeknight dinner. Plus, it's suitable for gluten free, paleo and vegan diets! If you'd like to bake this in an 8" x 8" square pan, you can. The bake time is about the same. If you can't get Japanese eggplant, you can use Italian eggplant (the fat, inky purple eggplant you commonly see in supermarkets). Try to cut it so that it is roughly the same size as the onions and tomatoes, even if that means cutting each slice into halves or quarters. That way, all of the vegetables will cook evenly. If you must replace some of the vegetables, try to go with similarly summery vegetables with a high water content (again, for even cooking). 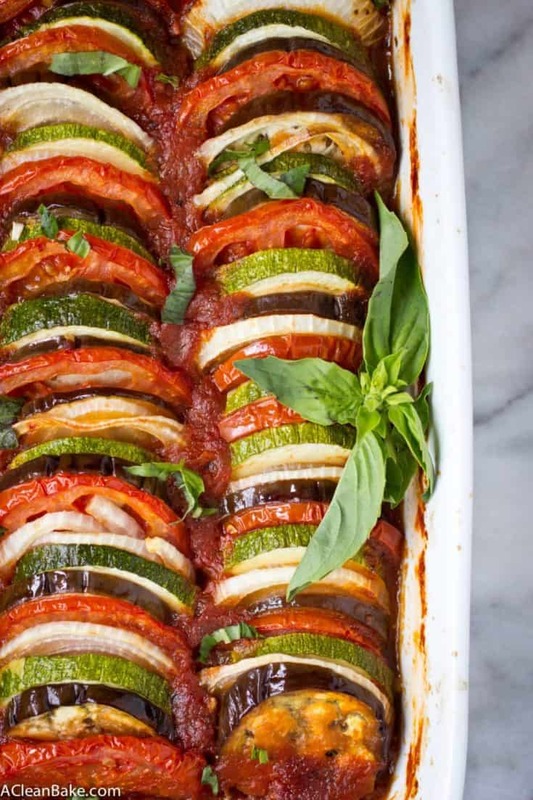 Try things like a bell pepper or yellow squash instead of zucchini, shallots instead of onions, or - like I mentioned above - Italian eggplant in place of Japanese eggplant. You’re so right! I echo all of your great points about the value of a CSA! 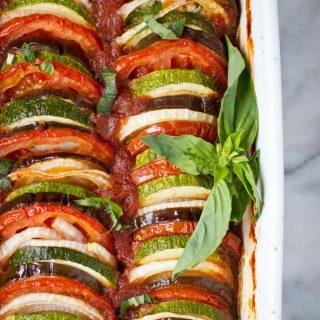 Can the ratatouille be frozen, either before/after , cooking without destroying flavor and consistency? Hi Roberta, sorry for taking so long to get back to you about this! I would recommend cooking the ratatouille in a freezer-safe dish, cooling completely, then covering tightly with several layers of plastic wrap (to prevent freezer burn) and freezing. Freezing should not affect the flavor but you may find that the veggies are a little wilted after defrosting. I’m sure it will still be an enjoyable meal though! This is the most gorgeous ratatouille I’ve ever seen! I’m hoping to join a CSA next year for the first time and I cannot wait. Thanks, Becky! I hope you love your CSA. It has really been worth it to join! Ours is year round; I wonder if there is one near you that is as well, so that you don’t have to wait until next year! Oh this dish is beautiful, Nora! I wouldn’t have even suspected that the pattern was not perfect if you hadn’t mentioned it! I’m not a fan of zucchini so I sub in sweet potato and it works great with my usual recipe (Moosewood). But next time I’ll present it like this. Mmmm! That sounds like a great idea, Shar! Especially in winter because here (in Chicago) where zucchini is, frankly, terrible in the winter. your ratatouille looks scrumptious. I have made this before and will make your recipe today. I also get a CSA and love it. I was wondering though you mentioned using the herbs to Provence on chicken? Do you not follow a whole foods plant-based diet? And your recipes are on finding vegan? Hi Gail! I hope you enjoy this recipe 🙂 As to your question about whether I eat a vegan diet, unfortunately the answer is no. I was a vegetarian for about 20 years and stayed vegan on and off for several years as well, but due to some serious health problems (which you can read more about on my About Me page), I have been unable to eat many plant based protein sources and have incorporated meat back into my diet. I still cook a ton of plant based dishes and over half of the recipes on this site are vegan or vegan-adaptable. If you’re curious, you can see all of my vegan/adaptable recipes here. Please feel free to email me if you have any questions about adapting any of the recipes! Have you tried adding nutritional yeast to your diet? I am on dialysis, so need more protein than when I was semi-vegetarian. I haven’t used a lot of Nutritional Yeast, Evelyn, but people say it’s a wonder food! Beautiful. Inspired. Made. Disappointed. The addition of tofu ricotta, kalamata olives and capers could enhance this recipe. I’m not sure what you were expecting, but this is a very basic recipe that relies on the pure flavors of produce at its peak of ripeness and seasonality. That said, it’s extremely adaptable, so I encourage you to add whatever ingredients you see fit. Try the juice of a lemon squeezed over this before it goes in the oven. I’ve made it that way for years. That’s a great idea! Thanks for the tip. Sorry if this sounds a stupid question but what do you mean by crushed tomatoes? Whole tomatoes chopped and then crushed or the squidgy tomatoes that come in tins. I’m itching to try this but don’t want to get it majorly wrong. Not sure if I’m misinterpreting it here in the UK. Hi Ginette! That’s not a stupid question at all. Here in the states, you can buy canned (tinned) tomatoes either whole, chopped or “crushed” which basically means pureed. If you can’t find them, you can buy the chopped kind and then just puree them yourself in your blender. I hope you enjoy this dish! No worries, Jamie! The great thing about this dish is how versatile it is. You can absolutely swap in green pepper for the roma tomatoes (I’ve never tried it, but I’ve used red pepper in addition to the roma tomatoes and it’s worked well). I wouldn’t bother with a special trip to the store *just* for the tomatoes. However, the crushed tomatoes that create the sauce at the bottom of the dish are pretty crucial so make sure you have those! I’m sorry to hear that, Jenn! A lot of things could have caused this, but my guess is either that your oven ran hot or the veggies were not packed together as tightly as mine were (less packed = more air circulation = faster cooking). Try cooking the dish for 30-45 minutes instead, and keep and eye on it. It is done when the tomato sauce is bubbly and the veggies are slightly shriveled on the edges. 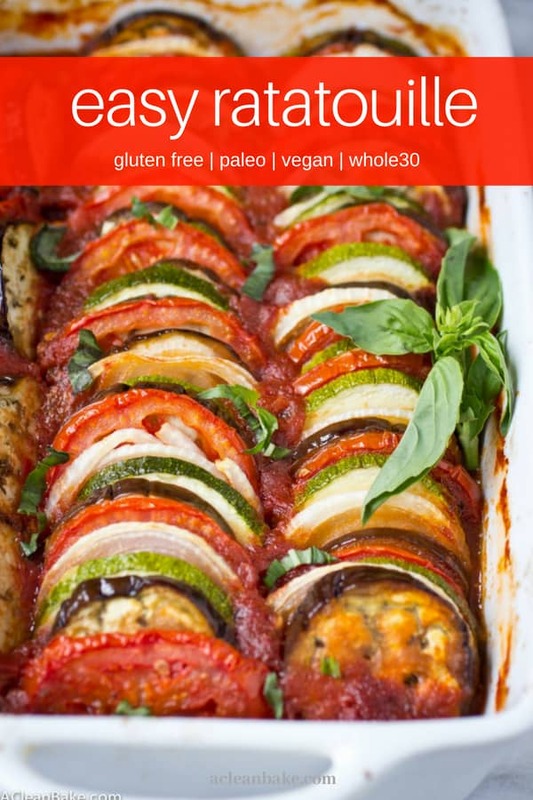 Oh, and one more tip: most ovens have hot and cold spots, so the best way to cook this is by positioning a rack in the center of the oven before preheating, then baking the ratatouille in the center of that center rack. Hope this helps. If you have any more questions, please let me know! How thick should you slice the veggies? Somewhere in the 1/4-1/2″ range should be fine. I think mine were closer to 1/2″. It looks great ! 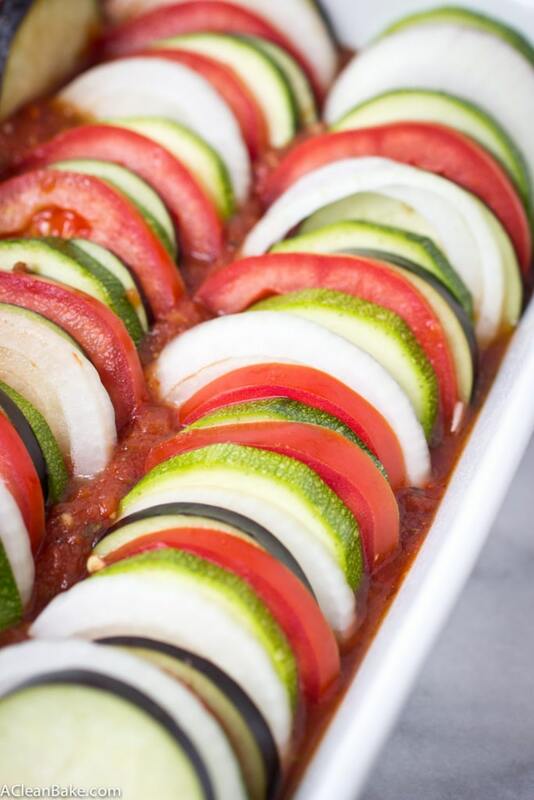 this is nooo ratatouille, like you wrote, ratatouille is more like a stew, AND if you want to do it the right way, each type of vegetable has to cook in a different pan ! No one has time for that. 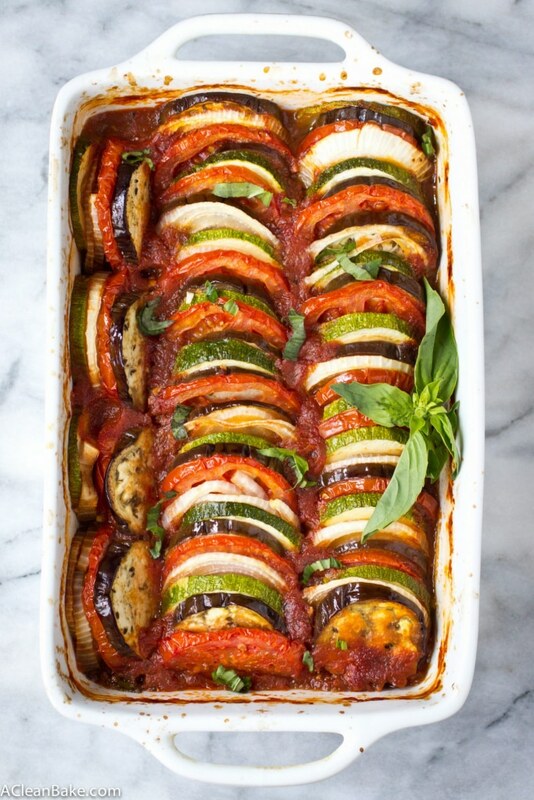 I hear you, but most American’s think of ratatouille as a casserole like this, rather than the traditional stew (especially after the movie: http://4.darkroom.shortlist.com/980/e2b84535bf1a8593243f5d9d0c47502f:fbafe7043e16a79a59200dbbdbf6f208/ratatouille-6.jpg). I had no idea that each veggie had to cook separately in the traditional recipe though. Even more reason to throw it all in one pan! Just made this dish today! It smells delicious! Anxiously awaiting to eat it!!! Thanks for the recipe! You’re welcome! I hope you enjoyed it!! Hi! I was wondering if you’ve ever tried prepping this dish and then freezing it for another night? With baby #2 on the way, I’ve been prepping double batches of everything and freezing one. I was wondering how this would hold up and if I’d have to increase the cook time? This looks so delicious! Hi Bonnie! You might be asking the wrong person because in my world, everything freezes 🙂 But seriously, I do think that this would probably freeze quite well after it is cooked. In case you need some more ideas, here is a whole article about prepping and freezing healthy meals for later: https://acleanbake.com/paleo-freezer-dinners/ I hope that helps! Congratulations on baby #2! Hey. This looks awesome. Sometimes whole foods carries the Japanese eggplant and other times not. If I can’t find it, would subbing a regular small eggplant work? Or does that change it too much? thanks! Hi Amanda! Yes, subbing a regular eggplant would be fine, but if it is much larger (wider, I mean) than the other veggies, you might want to cut the slices in half so that everything cooks evenly. I hope that helps! Would love to make this for my husband, who is a heart attack survivor and on a low sodium diet. Any idea on the nutritional information? Unfortunately, I don’t have the nutritional info but I can tell you that this recipe is naturally very low in sodium since it’s just vegetables and seasonings. Herbs de Provence should not have any added salt, nor should the canned tomatoes (but just to be safe, best to read the ingredients labels!). I suggest adding 1/4 tsp salt, but you can either omit that or replace it with a low-sodium salt substitute like Nu Salt or whatever your husband’s doctor has given permission to use. If you’d like the exact nutritional information, you can plug in all of the ingredients to a tool like the nutrition calculator on My Fitness Pal and then divide by the number of portions you’ll make from it – probably 2-3 decent-sized servings or 3-4 side dish-size servings. I hope that helps! Made this yummy dish for the first time according to your instructions and it turned out wonderfully. Thanks! I made this with everything from my garden! I added fresh jalapeños to the sauce and potatoes into the vegetable line up. I also topped it with red pepper flakes and a little mozzarella. It was phenomenal! Thank you so much!!! What a wonderful garden you must have! I love the sound of the changes you made – I just might have to try them for myself! Thanks for letting me know. 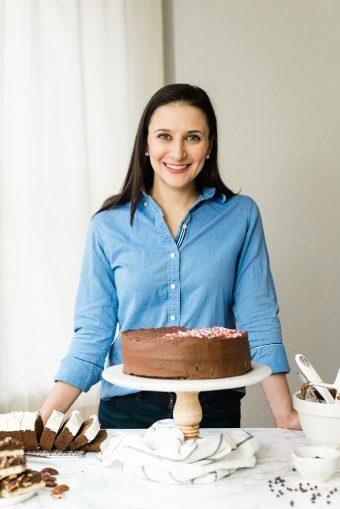 I always LOVE to hear about how these recipes turn out in others’ kitchens! I made this for lunch today and it sure did turn out beautifully – although in the end, we were still eating a giant plate of vegetables (well, fruits, if you want to get picky!). We added quite a bit more salt and topped it full of parmesan, which definitely helped. I was also hungry again in an hour or two, so it may fare better as a side dish for us. If I ever need to impress foodie friends, I may make this again as it really did look quite impressive and didn’t break the bank. Thanks for sharing! Thanks for the recipe! Any idea of what calories/serving are? I’m so sorry but I don’t, mostly because the serving size can vary depending on whether you serve it as an entree or side! Feel free to plug all the ingredients into a reliable calorie counter (I recommend Myfitnesspal.com) to get more info! This is SO yum! I added beets, steamed and sliced, and also also Italian sausage. It has the flavor of pizza which was such a hit for us while we’re on the Whole30. I’m thrilled that you enjoyed it, MariAnne! And making it into a crustless pizza casserole?? Brilliant!! Made this last night with my boyfriend who is not a big veggie fan…but he loved it! We decided to crumble fetta cheese over the top of the veggies for the last 30 minutes in the oven and that made it amazing! In my opinion it ended up a bit watery and wouldn’t have been a very remarkable dish without the cheese. However, the taste of the fetta with all of the veggies and herbs made it so yummy! We only have a 9 x 13″ baking dish so we doubled the recipe and ate almost the entire thing in one night! There are barely any leftovers and I can’t even count how many servings of veggies we got :p That makes me one happy dietitian! C’est un Tian! 🙂 Nice blog! Aussi, merci pour la visite! Would of been nice to know roughly how long to cook it, that seems to have been left out of the instructions. Step #6 instructs you to bake for about an hour, until the tomato sauce at the bottom is bubbling and the veggies are tender. I have made this once before and I am getting ready to prep it again for dinner tonight! I was amazed at how flavorful this dish was. I top it with a bit of smoked mozzarella and serve it on a bed of quinoa. FANTASTIC! Smoked mozzarella on top sounds incredible! Thanks for the idea and I’m so glad you are enjoying this recipe! Thank you for this delicious recipe! I made it tonight. First time I’ve even touched an eggplant… They’re so weird and rubbery! I sliced everything super thin and added some grated mozzarella on top and it DELICIOUS! my husband said the recipe is a keeper. The only thing I’d do differently next time is double the sauce it was so good to drag my chicken breast through! I can’t wait to eat the leftovers tomorrow! Thanks for letting me know! I’m thrilled that you enjoyed it! Just a side note about Herbs de Provence. The first time I bought some, I didn’t realize that many commercial brands contain lavender. Lavender in my bath water and body lotion: yum. On my plate: not so much. That was $6.95 wasted for me. Other folks may love the lavender taste and smell in their food, just not to my personal liking. Hi Michelle! I just added it below the recipe. I made this ratatouille today and didn’t expect that it tastes that good. Thanks a lot for that wonderful, easy and low calorie receipe. I had it in the oven for 50 minutes and in the last 10 minutes I spread small cubes of mozarella on it. We had ciabatta with it. So delicious. It looked beautiful coming out of the oven and tasted even better. Too bad it is so healthy. That’s great to hear! Why too bad? FYI there is no lavender in herbes de Provence mix when you buy a container of these herbs in France (I just double-checked since I have one handy by Ducros). Also feel free to sprinkle with Swiss cheese before baking (my mom’s secret ingredient). I’ve had many readers say that they have topped this dish with mozzarella but Swiss also sounds like a wonderful addition! Bon appétit a vous! Does the eggplant need to be salted first? No, but you can if you want. Without salting it, you’ll have a slightly runnier sauce. Either way is good. I made this once. Devil of a time doing it. I have a great mandoline slicer and whipped out all the slices, but like all zucchini, onions, tomato, etc., the slices were different diameters. Made it hard to put it all together. What a mess! But delicious. hi its look awesome thanks for sharing this. Yum! I made this tonight, served with a Frenched pork loin and it was exquisite. Very tasty, guilt free eating. And it looked as good as it tasted. I will definitely make this again. My husband had a quadruple bypass ten years ago, so I am always looking for healthy, delicious recipes. His doctor in Alaska told him that the healthiest way to eat is the Mediterranean diet, and I think this fits into that category. Can I prepare this in the morning and then bake it when ready to serve dinner in the evening? Can I prep this the night before and bake it the next day? I made this once and it came out great, but this time I, making for a holiday dinner and would love to prep it the night before. Can I use tomato sauce? Just to cut some time? Yes, if you have one you like, that should be fine! I used a small italian eggplant which I cut very thin. Also added green pepper and a couple mild yellow chili peppers and some harissa powder and Fines Herbs to the sauce. Had a nice spicy flavor. I cooked it for an hour but some of the eggplant did not get cooked. I don’t know if this is a problem if you use Japanese eggplant but it makes sense that the eggplant in the middle next to the tomatoes will get cooked and the slices toward the end might not. I think next time I would cover it in foil for at least the first half hour. Hi Patti, if you’re using an Italian eggplant, the slices will be larger so they won’t cook at the same rate as the other veggies. The trick is to slice them thinner and also cut them to size (e.g. a fatter eggplant might mean you need to halve or quarter the slices so they are the same size as the tomatoes). You can also cover it for part of the cooking process! I was excited to try a different recipe for Ratatouille since I’ve been making the skillet version for many years. In general, this didn’t turn out well for me, but I will say, I didn’t have the size dish you used, so that was probably part of the problem. It tasted okay – the eggplant was quite rubbery, but might have been due to how it was cooked and it was quite ripe. I used a round glass dish to put in the oven because my others were either too big or small. I also crushed my own tomatoes so there may not have been enough sauce. And the eggplant cut in half seemed too big as well because I did not have the Japanese style. Maybe I should have tried chopping everything up and just putting it in a larger dish as suggested to someone else. 🙂 oh well. The amount of moisture and size of the baking pan will make a massive difference in the success of the recipe. So using enough sauce and the right baking pan will ensure success next time. This recipe is fantastic. It presents beautifully, and tastes delicious. I recommend using the traditional method if you are unconcerned about how it will look. The traditional method is much more flavorful. Also, I used fresh chopped basil, garlic, onion, and hot red peppers instead of the dried herbs de Provence. Fantastic Recipe! I love Ratatouille! And all the ingredients are healthy!